Attended by the team, coaches, and management, Dice & Ice, presented by Scotiabank, is the Canucks’ signature charitable event in support of the Canucks for Kids Fund. Dice and Ice, presented by Scotiabank, was one of the highlights of the Canucks for Kids Fund 30th anniversary festivities. To mark the occasion it was held in the unique setting of Rogers Arena. 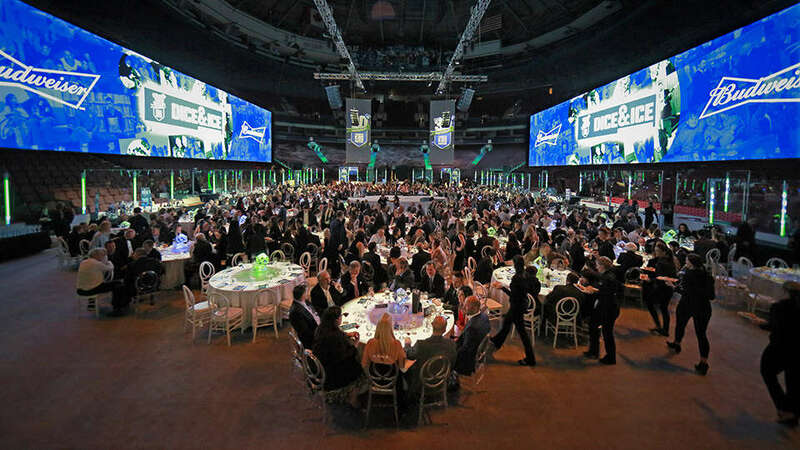 The venue was transformed to an intimate venue where guests could mingle with Canucks Players and their partners. The guest favourites Casino games and Pucks for Bucks were back along with a Champagne Sabering station and a one of a kind wine wall! The event raises money for the Canucks for Kids Fund, who’s main beneficiaries are Canucks Autism Network, Canuck Place Children’s Hospice and BC Children’s Hospital. The Canucks for Kids Fund would like to thank our generous partners for making this event such a success, a special word of praise goes to our presenting sponsor Scotiabank. We would also like to acknowledge our Major Sponsors, Labatt Breweries, Mission Hill, Rogers, Montecristo, Pepsi, Diageo, Tom Lee Music, Hemlock and Macquarie Group Foundation.